With a couple hundred artists at MegaCon this weekend, it'll be easy to get overwhelmed. 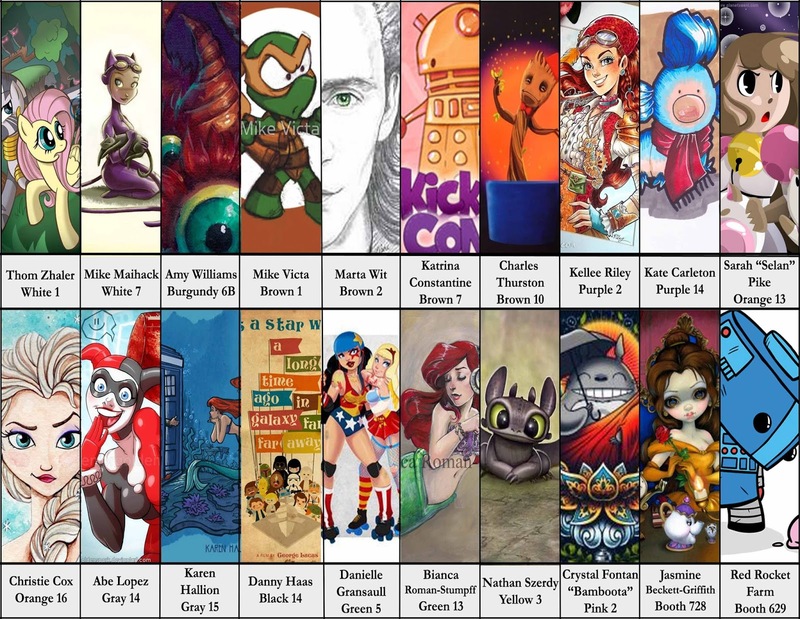 So, I decided to compile a handy visual list of my top 20 favorites for you guys, and where in the con to find them. I believe all of these have been featured on Epbot before, so you should recognize their work from my monthly roundups. And be sure to tell 'em I sent you, to receive ONE FREE SMILE*. A lot of these folks have since become great friends with me & John, so I can personally vouch for their approachability and general awesomeness, in addition to being fab artists. So if you see one looking bored, don't be afraid to say hi. AW YISSS. John put this together for me - yay formatting help! - and you can print it out on a single sheet of 8.5X11 paper. (Right click to save the image, and then make sure you have "shrink to fit" checked in the print box.) I've already printed out our copy, since we can never remember where everyone is. Happy hunting, everyone! See some of you soon! PS - If you're looking for me and John at the con, Artist's Alley is the best place to start. If you spot us, don't be shy! Or feel free to tweet at me for a meetup, though I can't promise I'll be looking at my phone too often. Hmmm...I wonder how many of these artists will be in Chicago for C2E2 at the end of the month? I'll have to look them up! I met Karen Hallion last year at C2 (I'm a sucker for anything Doctor Who and I *LOVE* her princess mashups. Gotta check out some of these others too! Will you be there all 3 days? I finally talked my hubby into going and I'm so excited! Yay! I can't wait! Any advice on how early to get there on Sunday? This'll be my first con (and I'm not from the area), so I have no idea how much of a wait to expect. Don't want to miss that Firefly panel! Ahh, I'm so envious. I'm going to my first con this summer, but I'm in Asia and I'm not sure if any of my fandoms will be represented, or if there'll be an artist's alley at all. Just checked Katie Cook's Facebook, she's at booth 436. Have fun at the artist's alley, that's always my favorite part of every convention! If I'm not too absorbed in the art and if I have the courage, I'll try to say hi! I'm so excited to see everything! Ooh, have fun, girl! Can't wait to see what art pieces you pick up this time! I live through your pictures and art finds. Karen is at table Gray 15.